Always on sale, we offer Olympic kilns for ceramics and glass fusing in both gas fired kiln and electric kiln models. Ask about our delivery and Professional Inside Setup. We carry all Olympic Kilns parts and accessories and we offer repair services as well. The frames of the Olympic top and front-loading commercial electric kilns are built of heavy angle iron and metal tubing. Walls are 4 1/2" insulating brick with 1" ceramic fiberboard and 1" air space created by the tube frame. The result is an energy efficient electric commercial kiln with a cooler skin and outside temperature. Top and front-loading electric kilns are all built with double insulated floors consisting of brick and ceramic fiberboard. Thicker doors and lids have been designed for the Olympic commercial electric kilns. The front-loading kiln doors are built with heavier steel and the 4 1/2" brick insert in the door for the elements is backed by 1" x 1" steel tubing and 1" ceramic fiberboard. The ceramic fiber in the door or lid is energy efficient and forms a tight seal between the opening and body of the kiln. Top loading electric kiln walls and floors are constructed of brick and board insulation, and modern pyro-brick modules comprise the easy opening counter-sprung lid. Floor elements when selected as an option are controlled by infinite switches and can be adjusted by the kiln operator as needed. All commercial electric kilns are equipped with heavy gauge elements for long life. Industrial relays insure quiet operation and long-life and the commercial electrical boxes are hinged and simplify kiln maintenance. 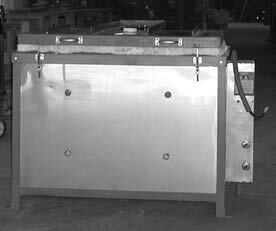 Furniture Kits for commercial electric kilns are available. Each kit consists of 4 layers of shelving, post assortment and kiln wash. Some kilns require crating. There is a charge for crating and additional weight is added to the shipping weight when crated. Custom designed kilns quoted and manufactured upon request. Olympic Kilns started manufacturing kilns in Seattle, Washington and derives its name from the Olympic Mountains. As the company grew so did its product lines to include electric, gas and glass kilns for the hobbyist, production artist and manufacturer of finished fired ware.